Do you have some of these? 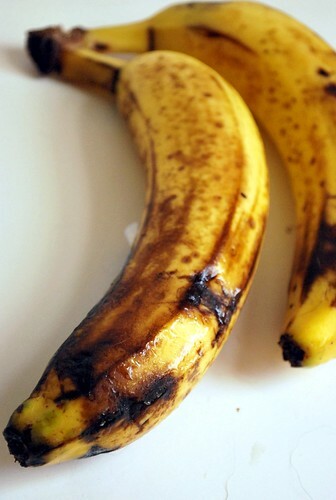 Or is your freezer full of bananas that got this far and you didn't want to use them? Yes? Let's make some banana bread. With chocolate chips. Sorry I've been absent for a few days. I started working! Finally. You may remember I haven't been working for a while, so being back at work is exhausting. Today Alex and I are both off from work, and I made this for breakfast. 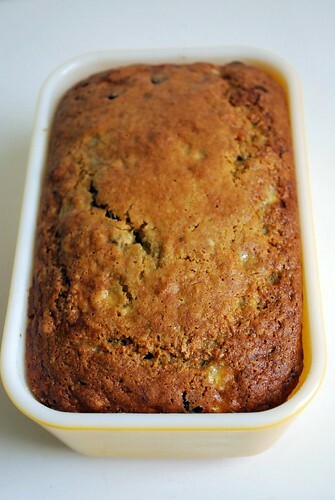 I halved this recipe, to use only two bananas, and used applesauce instead of butter. I'm trying to be healthy. Want to make this vegan? Skip the egg and use an extra 1/4 c applesauce. Recipe from epicurious. Preheat the oven to 350, then grease and flour a small loaf pan. Whisk together the 3/4 c rice flour, xanthan gum, baking soda, baking powder and salt. In a small bowl, toss the chocolate chips with the 1 T rice flour. Beat applesauce and brown sugar, then add egg, then bananas, then the vanilla and lemon juice. Stir applesauce mix into the dry ingredients, then fold in the chocolate chips. Spread batter in your pan, and bake bread for 45-50 minutes, and cool on a rack. We both must have been monkey brains today! I just made Peanut Butter Chip Money Muffins this morning. Craziness! This looks delicious! 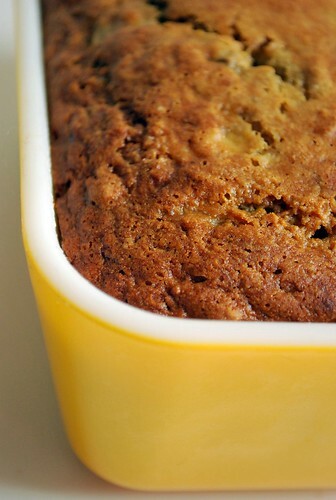 I finally got a loaf pan, so I can make banana bread instead of just muffins :-) I love subbing in applesauce for the butter - sometimes I just add extra banana instead. my brother always begs me to make banana bread before he leaves for college, and i get tired of using the same recipe. i'm going to try this! Can I use whole wheat flour and no sugar in this?